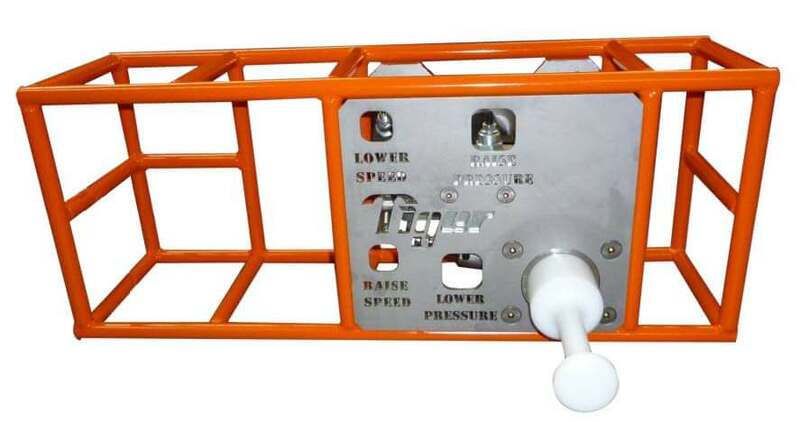 This subsea hoisting device by Tiger consists of two main components. 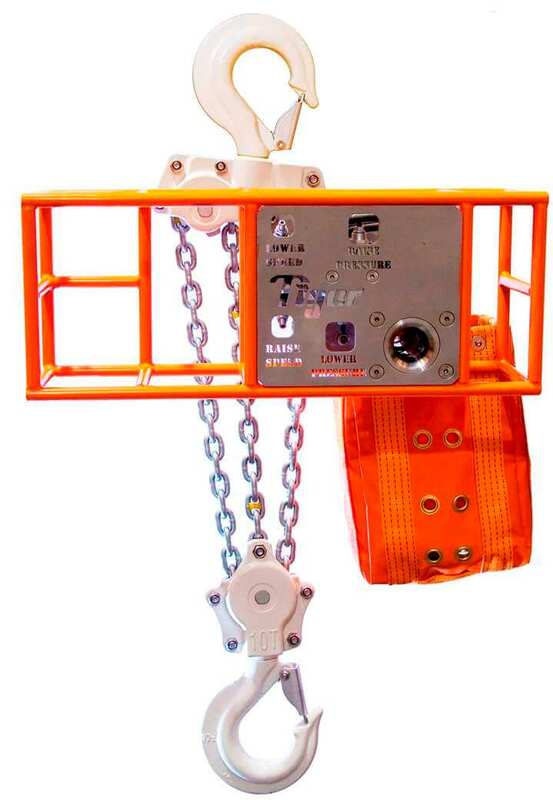 The SS12 subsea chain block and the special cage/ frame unit to make up the Tiger RCB ROV subsea chain hoist. This system is compatible with most ROV's. A ROV is a remotely operated vehicle. The framework is manufactured from 316 stainless steel for optimum corrosion resistance. It is evenly balanced for better handling. 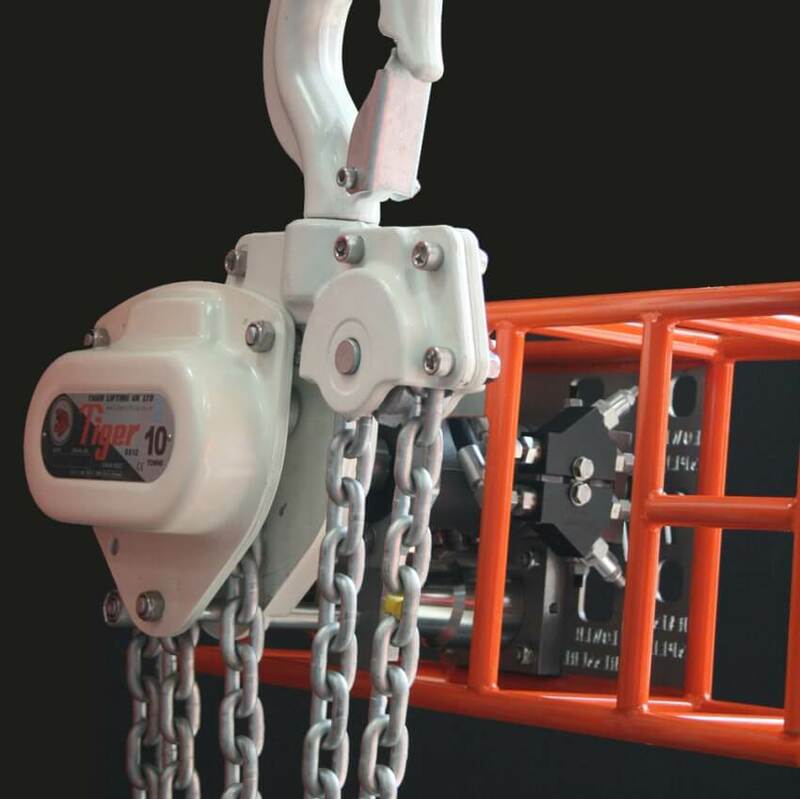 The Tiger RCB ROV subsea chain Hoist has a special brake design which is proven to be effective in subsea lifting operations. Also featured is the newly patented twin cam shaped pawl system. This is a proven brake design for subsea use. There are also four point manipulator connection points. 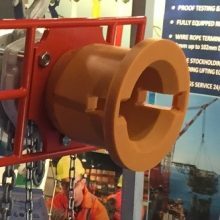 The bearings located within the top and bottom hook load sheaves are suitable for use in subsea environments. 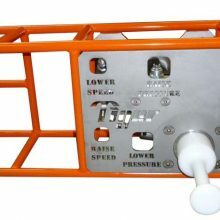 Other top features relevant to the subsea design are the one-piece brake cover and the marine specific friction discs. 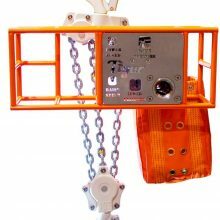 Additionally there is a heavy duty chain collector bag complete with its own stainless steel mounting frame. 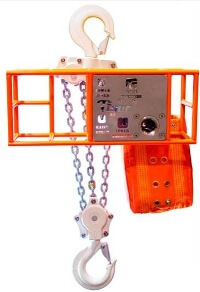 The chain length can also be specified by you. 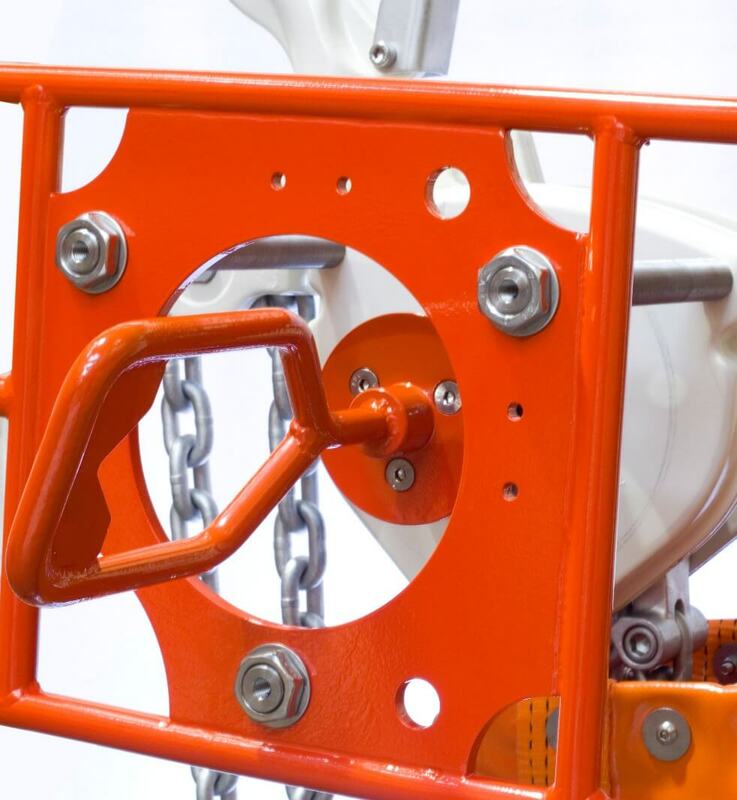 The chain hoist used in this subsea configuration is the trusted SS12 which has a fully corrosion resistant body, internal components & load and hand chains. It is by using the SEATEC 100 & ENP proven processes that the corrosion resistance occurs. Overall they guarantee over 1000 hours of continual use. This is according to the ASTM B117 salt spray test which has been carried out. The brake housing has a double cover in place for added protection. There are a number of different interfaces to choose from to best suit your specific subsea operation. All are compatible with a ROV (remotely operated vehicle). 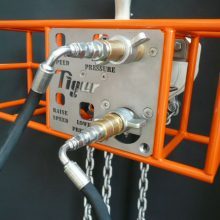 A hydraulic dual port hot stab female receptacle (type A) with easy identification of hydraulic adjustments. 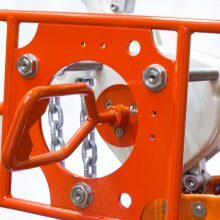 Fully protected by the frame handle which has 4 connection points for the work class manipulators to hold and operate. Featuring dual purpose directional valves which protect from loss of hydraulic fluid if the hot stab is removed. They also ensure minimal sea water ingress. 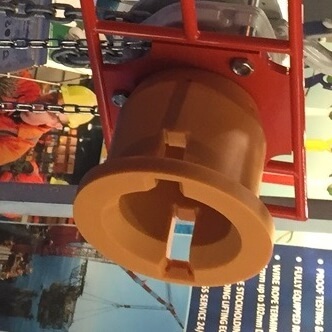 Supplied with a dummy stab to prevent debris ingress during transport and when connection is not used. A rotary torque tool in classes 1+2 or 3 can be supplied. This offers maximum tooling flexibility with torques of just 50Nm to lift 10 tonne. The fishtail manual direct drive tool enables an operator friendly interface. It has superb flexibility due to the supple compliance joint which gives a positive and very reliable direct drive device. The frame handle, made from 316L stainless steel is where all the interface options are mounted. It has 4 T-bar connect points to hold on to which tie-in with the 4 T-slots in parallel jaw manipulators. The frames are bright orange to indicate the ROV grabbing locations. 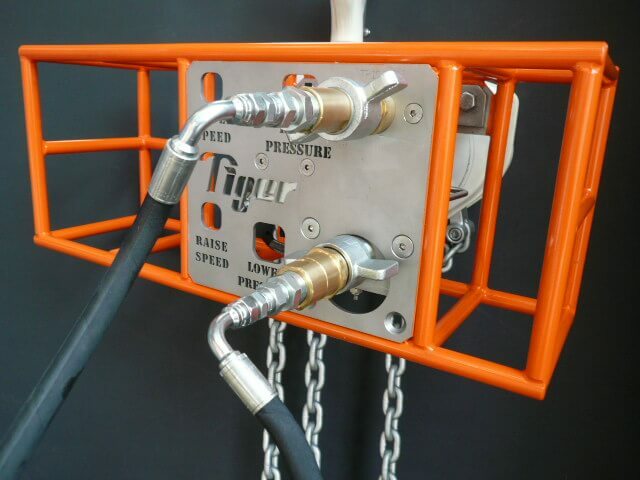 The highest performing grease is used on the Tiger RCB ROV compatible subsea chain hoist. This adds further protect corrosion protection, water resistance and operating stability. The swivelling hooks used are produced from drop forged – heat treated alloy steel. They incorporate heavy duty latches which engage fully in the hooks nose to ensure maximum load safety. High grade nuts and bolts are used and enable easy and complete inspection at all times. 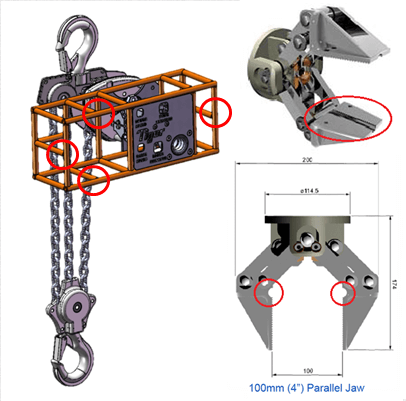 Recessed forgings give fuller protection to load chain anchor bolts. "Tiger RCB ROV Subsea chain blocks"
PDF opens in a new tab for your convenience.